When Madeline M. was in high school, her little brother’s many health issues caused him to frequent the hospital for appointments and surgeries. Although the sight of blood or needles made her squeamish, Madeline always put on a brave face and stood by her brother’s side when he begged for his “big sis” to come along. As a home health nurse, Madeline gets to follow a patient for weeks at a time and witness their improvement each week until discharge. Often, the patient and their nurses form a close bond which plays an important role in the patient’s recovery. Madeline’s role allows her to experience the day-to-day life of her patients and help them get back to every day routines. I find great satisfaction in taking care of a child in the comfort of their home. When we see patients at home, it means that they are one step closer to getting better. As the eyes and ears of their patients, home health nurses carry a great deal of responsibility. Given the independent setting of her work, Madeline often needs to be innovative in the way that she delivers care. “I’ve learned to be creative when going into a patient’s home, as sometimes resources are limited,” Madeline says. 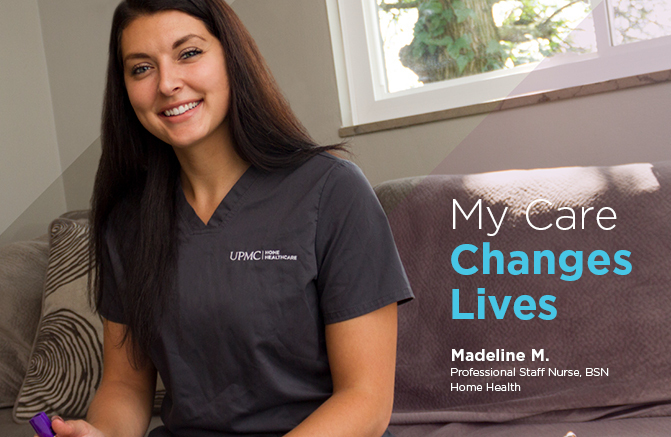 In her first week as a home health nurse, Madeline was assigned to a pediatric patient who was coming off a 79-day stint in the hospital. The child had arrived home just two hours before their first meeting, accompanied by a heart monitoring system and feeding tube. While the family had received guidance in the hospital, their child’s care practices were new and foreign. They were incredibly thankful to have Madeline’s support on their first day back home in 79 days.